Why settle for just a shed? Build a traditional post and beam building and be the envy of your neighborhood. Post and beam or timberframe construction isn’t any harder than conventional wood construction. These are time tested construction methods that people have used for hundreds of years to build classic New England style outbuildings. Build a shed or backyard cottage that you will love and your neighbors will envy. If you have access to full dimension lumber from a sawmill or lumber distributor nearby, you can build a post and beam building. All that is required is the lumber, nails and screws, a circular saw and some basic hand tools. With the construction methods and advice from this guide you can easily build your own post & beam shed. If you just need cheap storage for your lawnmower and yard stuff, do yourself a favor and buy a cheap metal or plastic shed. Now, imagine owning a shed that you can take some pride in. Enjoy the natural wood smell and the finished look of the wood interior with the heavy posts and beams. How about a custom built backyard getaway? You will love your new post and beam outbuilding so much, that you’ll have to go out and get a tarp to put over all your lawn and yard stuff. The Post & Beam Shed Plans Guide was written based on over 30 years of New England style post and beam shed construction. In fact the entire guide was written from my desk in my 16′ x 20′ custom post and beam office building. This is not just a set of blueprints or drawings and a stock list, like you might find elsewhere online. You will get advice on what materials to use depending on the purpose of your post and beam shed and actual photos of every step from the foundation to the exterior trim. You will not find a more comprehensive guide to building post and beam sheds anywhere on the internet. 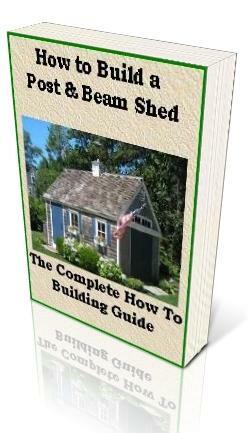 Download the post and beam shed construction guide right now!